US military scientists have invented a miniature drone that fits in the palm of a hand, ready to be dropped from the sky like a mobile phone with wings. The "micro air vehicle" is named after the insect that inspired its invention, the Cicada, which spends years underground before appearing in great swarms, reproducing and then dropping to the ground dead. "The idea was why we can’t make UAVs (unmanned aerial vehicles) that have the same sort of profile," Aaron Kahn of the Naval Research Laboratory told AFP. "We will put so many out there, it will be impossible for the enemy to pick them all up." 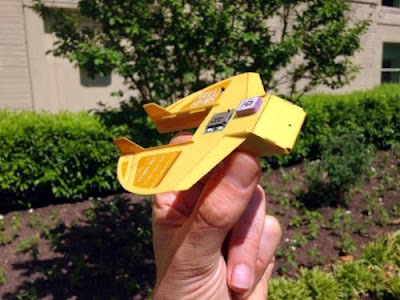 The "Cicada", short for Covert Autonomous Disposable Aircraft, was designed to be smaller, cheaper and simpler than any other robotic aircraft -- but still able to carry out a mission in a remote battlefield. The prototype cost just a thousand dollars, and the cost could come down to as little as $250 apiece, said Kahn, a flight controls engineer at the naval lab. With no motor and only about 10 parts, the Cicada resembles a paper airplane with a circuit board. It is designed to glide to programmed GPS coordinates after being dropped from an aircraft, a balloon or a larger drone, researchers said. In a test about three years ago in Yuma, Arizona, Cicada drones were released from 57,600 feet (17,500 meters). The little drone flew -- or fell -- 11 miles, landing within 15 feet of its target. The Cicada drone can fly at about 46 miles (74 kilometers) per hour and are virtually silent, with no engine or propulsion system. "It looks like a bird flying down," said Daniel Edwards, an aerospace engineer at the Naval Research Laboratory. But, he said, "it's very difficult to see." In the flight test, the Cicada had sensors that could send back weather readings for temperature, air pressure and humidity. But researchers said the mini-drones could be used for a myriad of missions, and outfitted with a range of light-weight sensors, including microphones. "They are robotic carrier pigeons. You tell them where to go, and they will go there," Edwards said. One possible scenario could be using the drones to monitor traffic on a remote road behind enemy lines. "You equip these with a microphone or a seismic detector, drop them on that road, and it will tell you 'I heard a truck or a car travel along that road.' You know how fast and which direction they're traveling," Kahn said. The micro-planes could be outfitted with magnetic sensors to pick up enemy submarines, or to eavesdrop on troops or operatives. For the moment, equipping it with a video feed poses a technical challenge, because extracting the video requires too much bandwidth, researchers said. Although the drones have yet to be deployed, the first use may come outside the battlefield, for weather forecasters.